One type of computer network for the Droid Bionic that you can use is Bluetooth. Bluetooth is simply a wireless protocol for communication between two or more Bluetooth-equipped devices. Or, if a little green check mark already appears by the Bluetooth option, Bluetooth is already on. You can also turn on Bluetooth by using the Power Control widget, as seen in this figure. Just touch the Bluetooth button to turn it on. To turn off Bluetooth, repeat Steps 1 – 3, removing the check mark by the Bluetooth option. When Bluetooth is on, the Bluetooth status icon appears, as shown here. 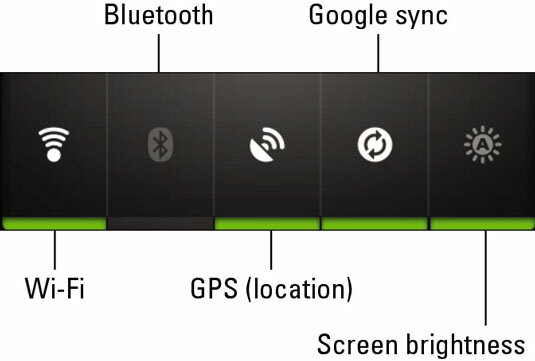 Activating Bluetooth on the Droid Bionic can quickly drain its battery. Be mindful to use Bluetooth only when necessary, and remember to turn it off when you’re done.